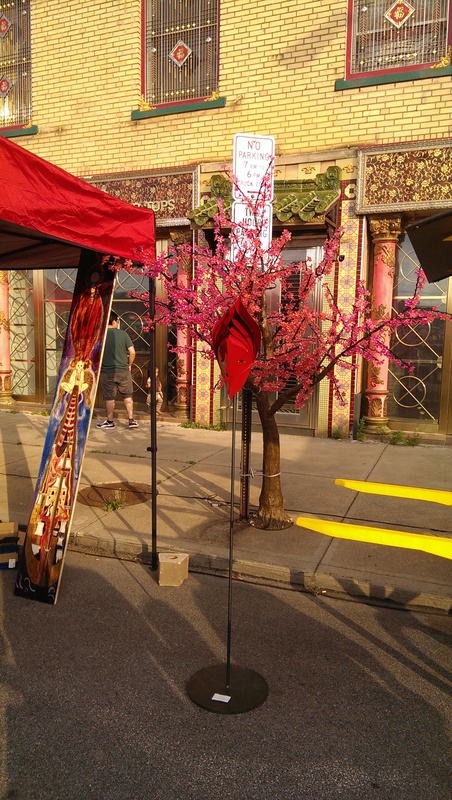 Night Market Cleveland is a summer event series that premiered in Asiatown June 26th and is held on the last Friday of every month through September. It was inspired by the Asian night markets, which originated in Asia as illegal “ghost markets” that bustled through the evening and vanished before daybreak. 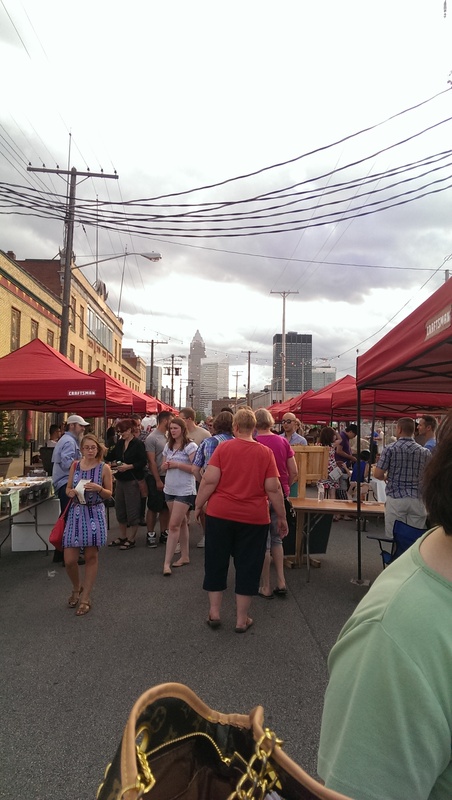 Night Market Cleveland is the brain child of Michael Fleming, Executive Director of St. Clair Superior Development Corporation. He got the idea when he was visiting Hong Kong. I wasn’t able to attend last month, but knew I wanted to check it out this month. I am so glad I did! I love Asian food and this embraced all different kinds of cuisines – from Nepalese to Japanese and everything in between! 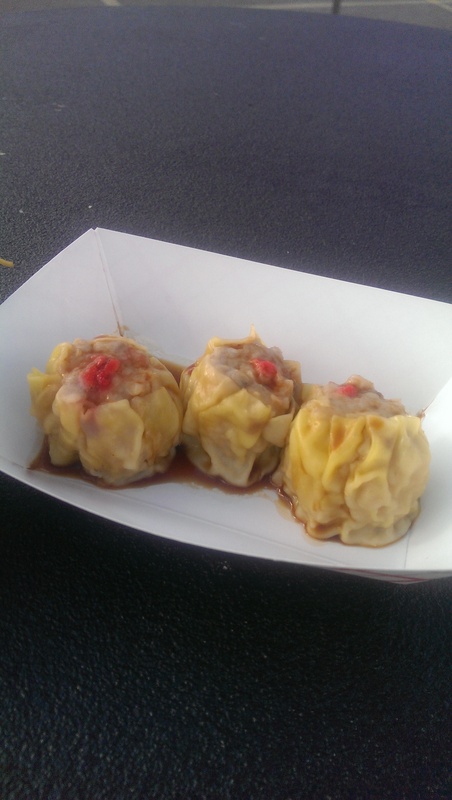 Organizers also invited outside fare not typically known for having an Asian influence, such as Pope’s Kitchen and Tremont’s Fahrenheit, with the caveat that they put an ethnic twist on their offerings. They have found a great location for it – on Rockwell and E. 21st in front of Emperor’s Palace and the big parking lot across the street. Vendor booths line Rockwell as well as the parking lot and there are vendor booths and food trucks in the parking lot as well as a huge stage. Strings of lights, colorfully lit fake trees and glowing performers lend ambiance after dark. It runs from 5 PM to 11 PM. They bill it as a family-friendly and pet-friendly event. I saw lots of strollers and a dog on a leash, so they weren’t lying. I was lucky enough to find a spot on E. 24th just off Rockwell. When I left at around 7:30 someone was thrilled to quickly take my place. Secure parking is available for $5 in the Plain Dealer lot. Off site parking is available at the Tower Press parking lot and Hot Cards parking lot located right off of Superior Road as well as on-street parking throughout the area. The star is undoubtedly the food. Lots and lots of street food ranging from huge combos featuring five or six different things for $7 to 3 pieces of dim sum for $2 or $3 or several pot stickers for $2. 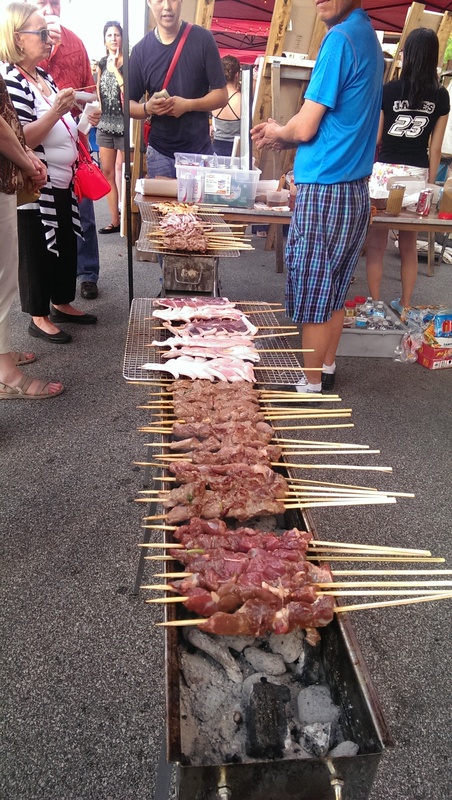 The longest line was for Han Chinese Kabob and Grill. It stretched down past two other vendors on Rockwell and that was at 6 o’clock before the crowds came. 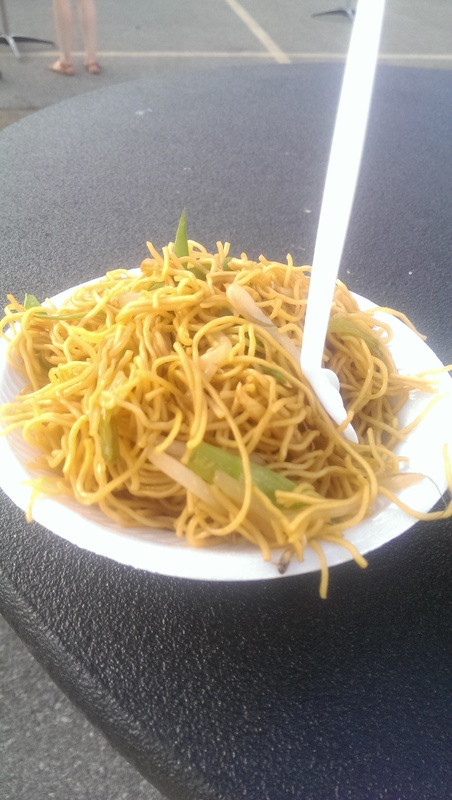 I started off with some shu mei and ginger sesame noodles from Li Wah for $10. The shu mei were my favorite savory bite of the night. They were moist and plump. I also enjoyed the noodles. Some people were adding protein like chicken to them. I saved my appetite for later. 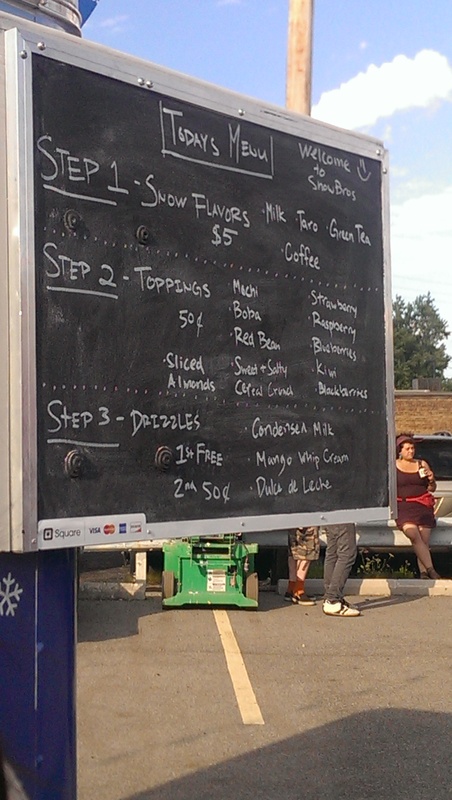 The one vendor I knew I absolutely wanted to try was SnowBros Shavery. They debuted their traditional Asian snow cones featuring cream, milk and fruit in June. 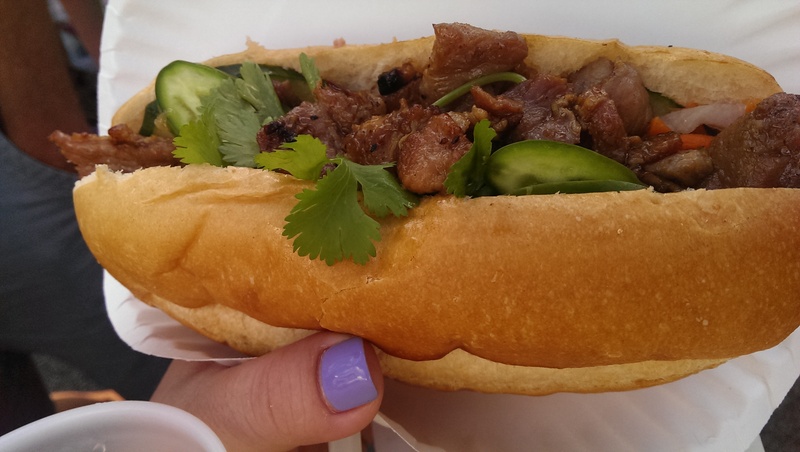 The newcomers hope to open a storefront in AsiaTown in the coming year. There were four “snows” to choose from: milk, taro, coffee and green tea. 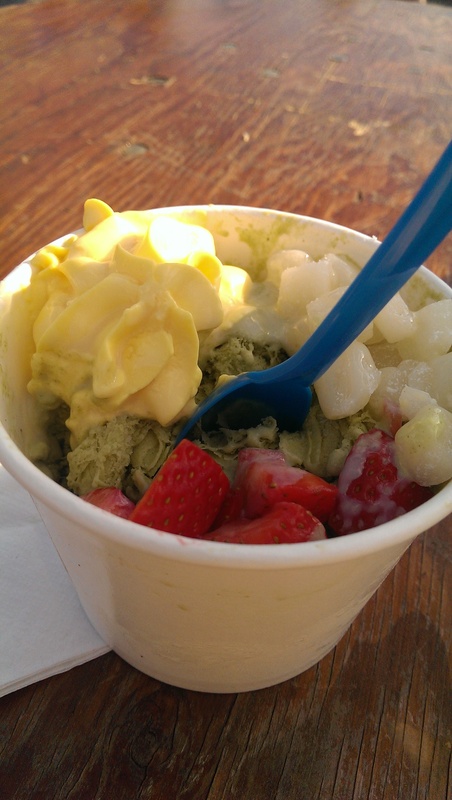 I chose the green tea and ordered the mochi at their urging as well as strawberries and then topped it with condensed milk and splurged for an extra topping of mango whipped cream. It was so worth it! Other toppings included boba (tapioca bubbles), red bean, sweet and salty cereal crunch, raspberries, blueberries, kiwi and blackberries. Dulce de Leche was the third choice for drizzle. 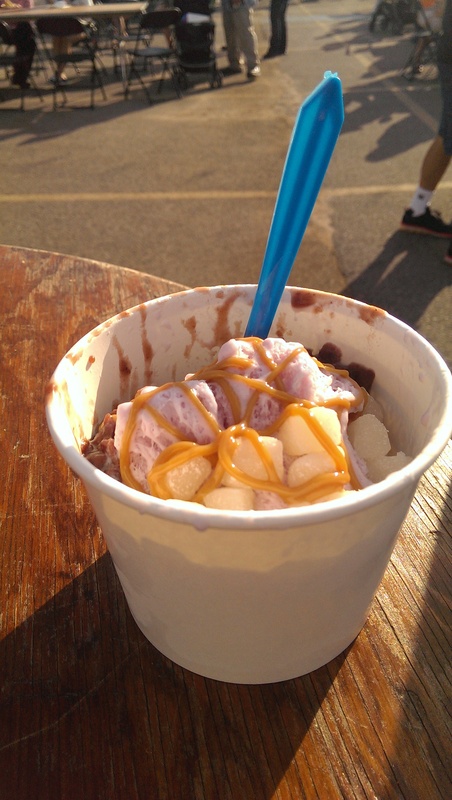 My friend ordered the taro snow (with a fun purple tinge), mochi, red bean and dulce de leche. She also enjoyed hers. She just lamented that the shaved ice she orders on the West Coast is much more plentiful, but maybe the food truck was limiting their volume. I first learned about shaved ice from her, so I defer to her judgment. We then walked around, sampling various things like a virgin strawberry daiquiri and pomegranate soda from Pope Catering (both were delicious, but the pomegranate soda made with his homemade grenadine was divine!) 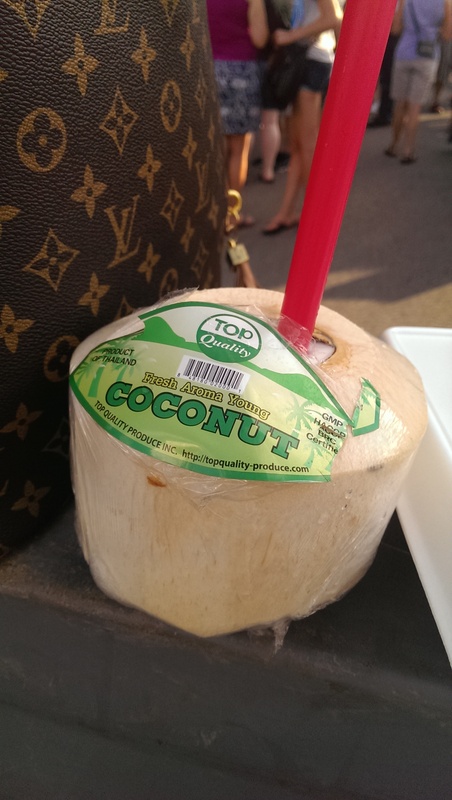 and fresh coconut milk from a young coconut that was lopped open in front of me ($4) and checking out the vendors’ wares, ranging from ceramics, jewelry, stuffed animals, those cats that wave at you, essential oils and soaps. They even had a bar serving draft beer and Asian-inspired cocktails run by Watershed Distillery. My friend was particularly fascinated watching a vendor named Love Triangle make fresh takoyaki and onigiri, two Japanese delicacies. Unfortunately they were running low on rice and tapped out pretty early on. Other vendors included Szechuan Cafe, Flavors of India, Emperor’s Palace, Koko Bakery, Asian Food Co., Asian Grill, Siam Cafe, Mitchell’s Ice Cream, Fahrenheit and Wok and Roll – just to name a few. Their website has a full list of all the vendors. I grabbed a bahn mi ($5) from Pho Thang Cafe and a fried rice and egg roll combo ($4) from an unnamed street vendor to go for later. One organizer-related vendor also offered to-go food kits for $20 so you can make monthly traditional Asian recipe at home. This month it was pork lo mein. I ran into a couple more friends on the way out and stood a while chatting while they all nibbled on kabobs and pot stickers. I was glad I got there early because I got my pick of food, but I am tempted to come after dark next time to experience the magic of the true night market. It must have also gotten crazy tonight, because the Critical Mass Bike Ride was scheduled to end there. I remember being stuck in traffic in Lakewood and Gordon Square because of the ride last year. The next Night Market is on August 28th, and the last one for the season will be September 25th. Be sure to check it out!